Speaking of Bóthar... 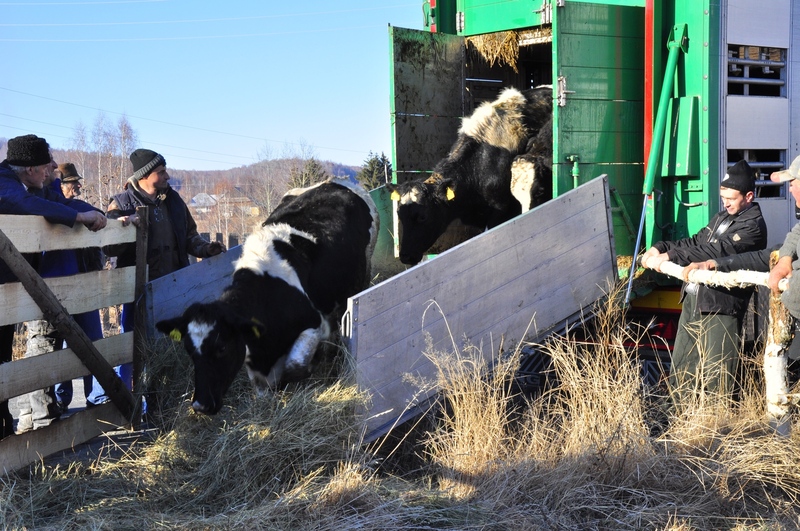 Remember when they shipped 70 heifers from Ireland to Romania as part of a Heifer project? 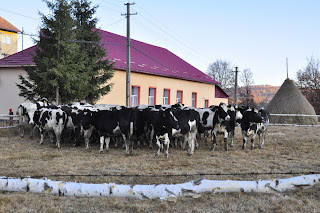 Irish heifers arrive in their new Romanian village. 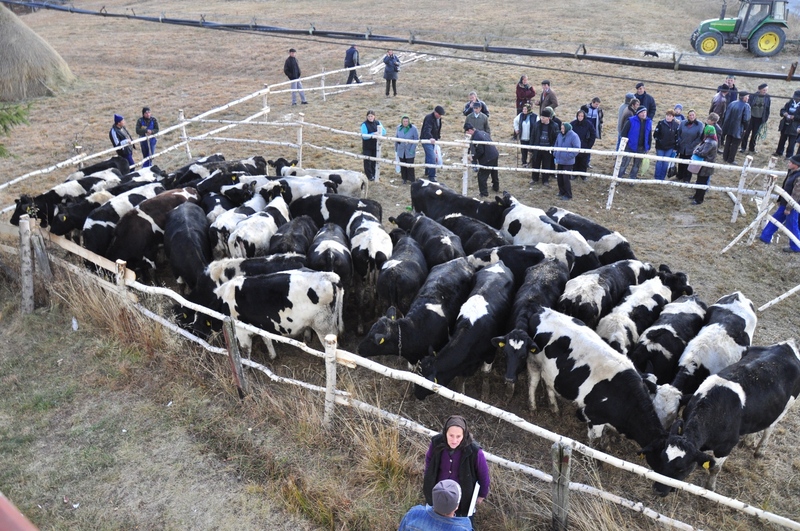 The crowd eagerly awaits the distribution of the heifers. We've just learned that earlier today, 42 of those heifers and one male calf reached their new farmer families in Rasca commune. 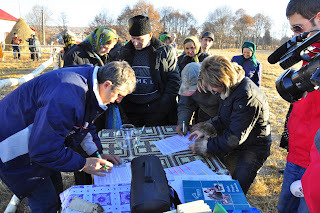 Heifer Romania held an original livestock placement ceremony near the town hall in Rasca. The heifers waited patiently until the lottery draw was finished and their new owners could take them home. much milk as the local cattle breeds. 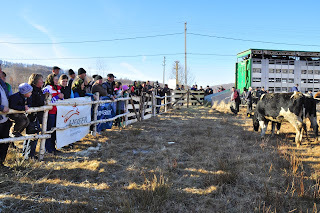 Over the past week, the community has waited excitedly for the announcement for the coming cattle. There were more than 100 requests to become project participants and receive the gift. The applications were sorted and future beneficiaries chosen according to project criteria (poor farmer families, the unemployed, families with children, possibility and capacity to properly feed and house the livestock, willingness to Pass on the Gift). their heifers' first female offspring. The number of people attending the ceremony exceeded expectations. 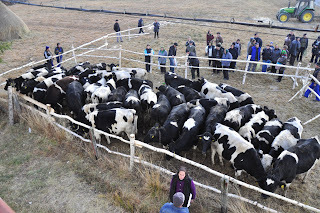 All families who applied for the project came to see the animals and were impressed by the high quality of the heifers. Villagers were enthusiastic and said they never believed the animals would be in such an excellent condition. Families not selected for original placement will eagerly await the first Pass on the Gift ceremony. 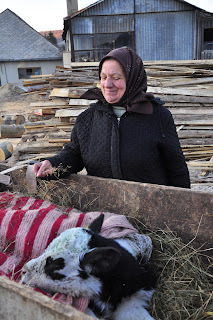 Dorina smiles over her new calf. Suspense filled the crowd, as everyone was wondering who would pick the ticket for the cow with the calf. Applause burst when the ticket number drawn by Mrs. Nistor Dorina brought her the mother cow and male calf. She was excited and, while covering the calf with a blanket said, "God bless the Irish families that made this possible. Such happiness is rarely felt! Thank you very much." Rasca commune is about 56 miles from Cluj. About 60 percent of the families here do not have consistent incomes. They are trying to establish small-scale private farming in order to earn a living. Through this Heifer project, the families will improve their nutrition and increase their income by breeding Holstein Frisian cows, well known for their high milk production and rapid adaptability to various climate conditions. These families will also pass on the first female offspring of their dairy cows to another impoverished family, and they will donate 79 gallons of milk to orphan children. These heifers are ready to settle in! The heifers must be glad to be home after traveling for three hours from the quarantine farm where they spent the last month. Their new farm families are certainly glad to have them. Information provided by Laura Manciu, communications and public relations coordinator for Heifer International's Romania Country Program. Previous Article Says Goat: Are We There Yet?